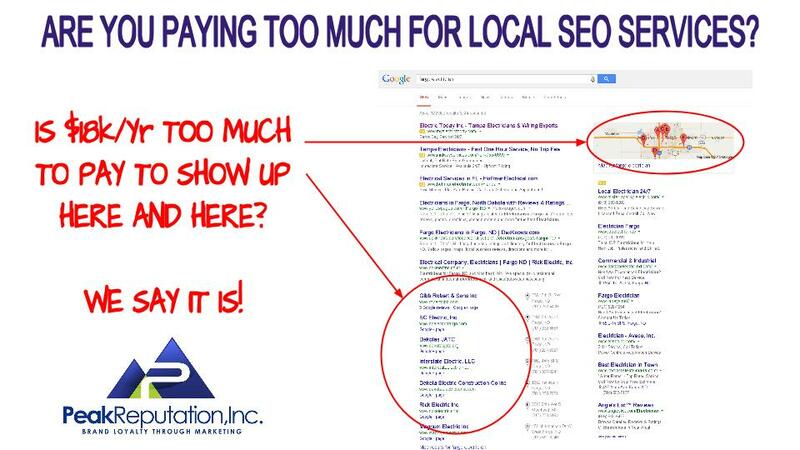 Are You Paying Too Much For Local SEO Services? Home / Blog / Are You Paying Too Much For Local SEO Services? Asking this question regarding Local SEO (Search Engine Optimization) Services is like throwing gasoline on a fire to see if it’s already out. When Local SEO Services were first offered, it wasn’t uncommon to hear quotes as high as $5,000.00/Month for even small to medium sized businesses. Those prices have pretty much disappeared, but when Local SEO Services still average in the neighborhood of $1,500.00/Month and can climb north of $2k, it’s still a relevant question: Are you paying too much?! Before we can really address this, it’s important to understand what these services include at these prices and compare that with what SHOULD be included to reach your SEO goals in your marketplace. The goals for these services are pretty obvious. When a potential customer/client/patient searches for a local business on Google, you want your business to show up on page one of the organic (unpaid) results and to show up on the Google Map at the right top of the page as well. An added bonus would be to show up in the organic results below these two items but still on page one. Accomplishing these goals is pretty straightforward as well. Regardless of what you may have been told, achieving Local SEO rankings on Google is not akin to witchcraft! Google has made it pretty clear what they want to see. Local Citation Building – There are just over 300 important citation sites on which your business needs to be listed. These need to be identical listings for consistency in order for Google to give you one of those coveted spots on page one. Business Reviews – Notice on the image above that the number of reviews that each business has on Google+ is shown. Reviews are gaining in importance and not just for SEO purposes! Fresh Original Website and Social Media Content – This primarily comes into play for those listings below the ones tied to the Google Map, but when push comes to shove, Google will ALWAYS give preferential treatment to fresh, original website and social media content. Addressing these three things is the job of any professional SEO agency. Yet, most of the agencies charging $1,500-$1,800/Month are only addressing the first two, with the second really only barely being addressed at all. Local Citation Building is done initially via several aggregators that submit your listing to the directory sites that matter. While most companies will do this for you initially, it’s vital that this is done regularly to maintain accuracy and prevent others from claiming your listings. You can, of course submit to these sites manually, but that would require a major investment of time and resources. Getting Business Reviews is more and more important all the time, particularly on Google+. Most of the directory sites your business will be listed in also permit users to leave reviews. Almost none of the agencies offering Local SEO Services include any means of promoting reviews to your Google+ page or the bigger review sites like Yelp! and Angie’s List, let alone providing a means of protecting your business from negative reviews. Providing your website with fresh, original content isn’t even on the radar of 98% of the agencies offering Local SEO Services. They simply do not have the support staff to research, write and optimize content for multiple markets. With less than half of the necessary SEO tasks being included in packages costing a median of $1,500-$1,800/Month, what would it cost to address ALL of these items? Should You Use Social Media Automation?